Land Destruction is another great example, as it fits squarely into Control. Your goal is to deny the opponent the mana they require to cast spells, thus allowing you to gain the upper hand by way of a dominant board position. Cards like Faultgrinder allow you to both maintain your land advantage by destroying a land, as well as benefit your board position by providing a 4/4 creature! Finally, there's Combo. Of the decks in my meta, and even from what I've seen of Standard, there's not much Combo going on these days. The last true combo deck I recall was before Innistrad with the Splinter Twin deck. This combo looks to use Deceiver Exarch with a Splinter Twin to generate an infinite number of hasted copies of Exarch and then attack for the win. I mentioned Illusions earlier as being a tie-in between my local metagame and competitive Standard. They had a pretty impressive turnout at the Magic Worlds competition in San Francisco, with over 15% of all registered decks being Illusions. I've played a few matches against my local Illusions deck and it can be really tough to beat. The deck utilizes cheap Illusion creatures, such as the Phantasmal Bear and the Illusion Lord, Lord of the Unreal to help offset their weakness of being targeted. This deck is a serious Aggro style, often dropping a 2/2 Bear on turn 1, and pumping him up to a 3/3 Hexproof with the Lord on turn 2. But then it doesn't just do Aggro, Illusions also have a Control twist. By including disruption spells such as Mana Leak, and occasionally some end-game finishers like Wurmcoil Engine the deck gets going strong from the start, and can have more staying power than something like Red Deck Wins, a famous mono-red Aggro archetype. As I mentioned last week, these three Archetypes act like Rock-Paper-Scissors in Magic. Aggro beats Control by getting an early lead on board position and swinging hard and fast early to mid-game. Control beats Combo by disrupting the integral pieces of the deck's combination. Combo beats Aggro by outracing the Aggro onslaught with their game-winning combination. 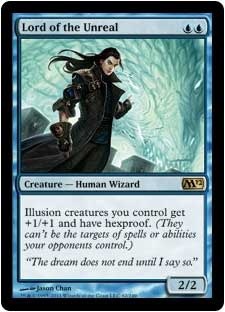 Of course in Magic the possibilities are endless, so you can expect to see any number of subtypes and hybrids of these archetypes in the decks you face, such as the blend of Aggro and Control aspects in Illusions. Another great example is the Ramp style deck, which uses spells like Rampant Growth and Birds of Paradise to accelerate mana production, thus giving access to higher powered spells much earlier in the game. Ramp decks can potentially fit into any of the three archetypes, depending on what they aim to do in the long run, though they are most often some hybrid rather than being a pure breed. As was mentioned in the comments last week, Wolf Run Ramp which uses Primeval Titan and Kessig Wolf Run to power damage through isn't a very good fit in the role of Aggro. It's slower than Aggro and it aims to Control the board long enough to stay alive while it's ramping up to Titan mana. My own casual Ramp deck, Greenihilator, however, isn't as well rounded. It just wants to drop a creature with Annihilator on turn 3 or 4 and go to town. I don't think this can be classified as anything but mid-range Aggro. Finally there is Valakut Ramp, which just cycled out of Standard, and used Valakut, the Molten Pinnacle and Primeval Titan to combo a quick win. The deck used a number of other favorable interactions such as Khalni Heart Expedition to really power out some damage once Valakut was online. I consider this a great example of a Ramp Combo deck which can drop a Turn 4 Titan and Turn 5 lethal damage from Valakut on an ideal draw. Given the prevalence of Ramp decks over the years, they may be worthy to be considered a fourth archetype. Depending on the build, they can fit anywhere into the paper-rock-scissors dynamic pretty well. What does your meta look like? Is it Aggro-heavy? Control? Or is there a Combo out there that I've overlooked and is dominating your day-to-day Magic games?